The past few years have seen many great and not-so-great horror films of the 70s and 80s become fodder for remakes and "reimaginings," usually to lesser effect and much grumbling from everyone. With all these movies being revisited, it's not a huge surprise that someone eventually got around to Maniac, William Lustig's grimy exploitation flick from 1980. Far from a classic, it remains a quintessentially grim serial killer flick of the era that benefits from an appropriately odious performance by Joe Spinell. 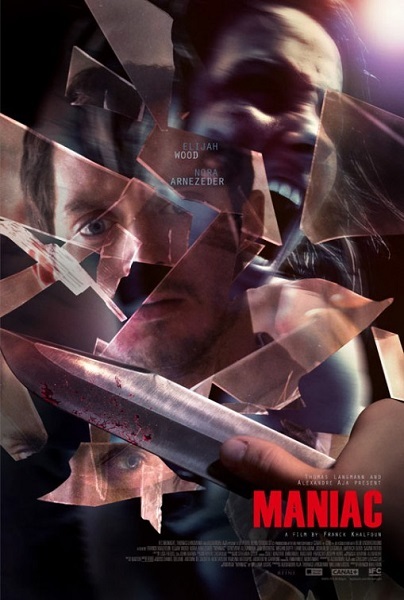 What does comes as a surprise is how the new version, produced by French horror impresario Alexandre Aja and directed by Franck Khalfoun, who previously gave us the uneven but suspenseful P2, distinguishes itself from other remakes by doing exactly what it should: take existing material and give it relevance by offering a new perspective, in this case both literally and figuratively. 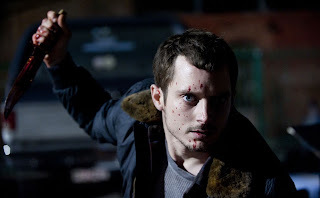 Starting with the unlikely casting of Elijah Wood as the titular monster and continuing with the daunting and technical challenge of lensing the whole film from the killer's perspective, Khalfoun and Aja elevate the premise beyond the grindhouse ambitions of the original into something that's deeply unpleasant on both the visceral and conceptual level: a portrait of all the worst aspects of the masculine mindset in terms of male/female relations. The movie follows the general story points of the original in its portrayal of Frank Zito, a disturbed young loner whose upbringing by his prostitute mother has thoroughly twisted his conception of relations with the opposite gender. Unable to socialize with women, he instead preys on them, murdering them and gruesomely using their scalps to create life-size dolls using materials from his mannequin shop, providing himself with a harem of passively plastic companions. 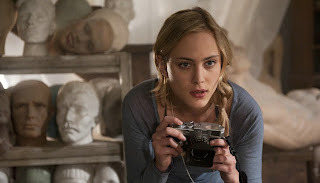 Frank's insular world becomes disrupted when Anna (Nora Arnezeder), a beautiful art photographer who uses mannequins for her installations, visits his shop. She seems to see an intriguing mystery in Frank's reticent manner and feels an artistic kinship with him based on the meticulous care with which he restores antique mannequins. For his part, Frank takes shaky steps to pursue an actual relationship with her, but we are constantly aware that it's only a matter of time before his homicidal impulses emerge. The exact psychology behind those impulses is never totally divulged, even though we clearly see their origins stem from his mother bringing her clients back to their apartment, exposing her young son to sexuality while probably never taking the time to help him deal with it. There's a suggestion of duality to Frank, that perhaps there is a side of him that doesn't even realize he's going to kill these women when he pursues them and a side that's actively punishing them for his mother's perceived sins, the kind of plausible mental disconnect that manifests in many serial killers. As such there's a level tragedy to the character that might make us pity him if it wasn't for the horrible things we have to watch him do. That brings us to the most obvious innovation Maniac presents: the risky decision to shoot virtually the entire film from a first-person-perspective, especially since it's the viewpoint of the murderer himself. The first-person viewpoint isn't really new, having been done in mystery films like Lady in the Lake and found-footage films, while slasher films like Halloween and Friday the 13th have put us into the killer's shoes on a limited basis, primarily as a way of concealing the murderer's identity. But to put us into the villain's head for the whole running time is daring since it essentially eliminates the possibility of shock scares and totally upsets what would be the normal set-up for this kind of film: we would meet a potential victim and follow along with her, waiting in anticipation for Frank to strike. 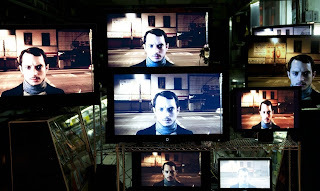 Instead, the suspense comes from being forced to watch helplessly as Frank stalks his victims and commits his vile deeds, implicating us in the crime. Most horror films and arguably films in general reflect the concept of the male gaze, the idea that the hetero-male viewpoint is the norm through which a story is told, particularly when it comes to the visual depiction of women, who usually have their sexual attractiveness emphasized for the pleasure of male viewers; for example, how many movies have introduced a female character through a close-up on her legs or behind? But by forcing us into an unstable masculine point-of-view, the dangers of male gaze become harmful to women not only in a sociological manner but a literal one. Happily, the POV isn't comprised of the shaky camera style we've become accustomed to in found-footage films but smooth, steadicam shots that more accurately represent human perception. Khalfoun also isn't afraid to telescope time or switch to slightly different angles within Frank's viewpoint and cleverly uses focus to suggest Frank's self-control beginning to slip. The conceit is never broken, with the few times we actually see Wood onscreen depicted as flashbacks or something akin to an out-of-body experience, but even then we remain trapped in his head. Even with the limitations of the perspective, we get small but chilling moments of character from Frank, exemplified by a scene in which he takes a deep, cleansing breath before he moves in to finish off a wounded victim. Before we get into the next point, we should talk about the casting of Wood, which is a bit surprising given not only the nature of the role but his reduced screen-time. To be sure, Wood has played creepy villains before in Sin City and a particularly chilling episode of Homicide: Life on the Street, but the level of depravity and the degree to which we are immersed in Frank's twisted psychology could be enough to make any actor second-guess getting involved in such a production. 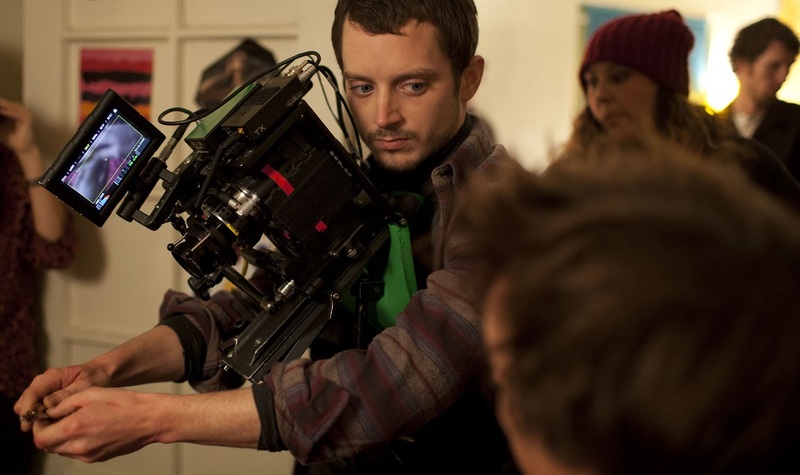 Wood however gamely plays against his usually personable onscreen persona, with his characteristically wide eyes taking on a haunted, desperate quality that suggests Frodo Baggins has finally become Gollum. 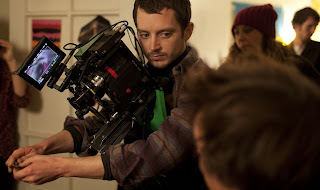 Even though he is only seen briefly onscreen, production stills like the one above prove Wood is committed to the part to the degree that even when only Frank's hands are visible, it's Wood operating the camera to maintain his performance. Wood's casting and performance also transform his psychopath into a monster for the modern dating world. Frank's social awkwardness and reticence allow others to project qualities and depths that do not exist there. We watch with horror as he trolls for victims on an OKCupid-style dating site and lures them in with his shy charm, offering the promise of a refreshing change from the jerks they're used to dating and leaving them totally unaware of the rage and homicidal possessiveness that lurk behind his sweetly clumsy exterior. This is something that wouldn't quite have worked with Spinell's performance in the original. With respect, Spinell looked at first glance like the guy you assume is a serial killer. Wood looks more like an introverted hipster. It is through his relationship with Anna that Frank becomes a gruesome reflection of 'nice guy syndrome' as well. Arnezeder is luminous as the unfortunate object of his interest, the kind of warm soul who is outgoing and free with her time and attention, unaware of how they're being mis-interpreted. To Frank, they are indicators that she might understand his world, that she can look upon his collection of antique mannequins and see something what he does. There are also hints he sees in her someone who might fill the void of maternal love that he was denied. But when she casually reveals she has a boyfriend during one of their outings, it's a moment of heartbreak and disappointment that many guys will relate to; it's never occurred to Anna that Frank could see their time together as anything other than a friendship stemming from their interactions as fellow artists. Unfortunately a violent personality like Frank's can't accept the situation and isn't content to be stuck in the friend zone. Finally, we get to the objectification of women, a problem literalized by Frank's grisly M.O. : applying his victims' scalps to some of his mannequins to recreate them as something he can control: dolls that he can pose, that will never talk back, never reject him and can never leave him. As with many guys, the safety of such a one-sided relationship seems more comfortable to Frank than the rigors of actual social interaction. Another of the film's underpinning concepts seems to be the way men contort women into the roles to fulfill their own needs. Beyond Frank's need to both punish and replace his mother, the movie has its violent way with the 'manic pixie dream girl' trope, that adorably quirky girl who's only purpose in a movie is to help the troubled male protagonist overcome his issues. Frank has an awkward date with a young woman who seems as though she could fit into this mold, but the kind of issues Frank suffers from won't be so easily overcome. Fans of the original might note a few direct homages sprinkled throughout, including a moment where Wood recreates the original's infamous movie poster and gets the chance to yell that poster's tagline. There's also a nostalgic appeal to the film's score by Robin Coudert, which evokes the synth scores of horror films from the original movie's era and adds to the film's unsettling ambience. The filmmaker's even manage to sneak in "Goodbye Horses," a song loaded with creepy connotations for horror fans. In parting, it should be made very clear that Maniac is an incredibly disturbing film on all levels. The format of the film demands that the camera linger on the bloody particulars of Frank's actions and not look away and the film, released unrated, goes way beyond the standard gore levels, especially since the violence isn't rendered in an exaggerated manner that might soften the impact. But even more so, the film's unrelentingly grim tone and its willingness to crawl right into the psyche of its misogynistic protagonist guarantees that this is not the kind of horror film you have a good time at. It is however, scary in ways that most horror films never aspire to.